What’s it like to ride in a Level 4 driverless car? About the same as sitting on the bus, really – until you think closely about what a driverless pod whizzing down a riverside cycle path is actually achieving. The Register went for a drive in one of the driverless pods being trialled in Greenwich by the Gateway consortium. Their electric vehicles are driven by Fusion Processing's autonomous vehicle sensing and control system, named Cavstar. Fusion’s chief exec, Jim Hutchinson, spoke to us before our trip around the Greenwich Peninsula, describing the Gateway project as "the UK government funding UK business for UK customers". "It has been a three-year journey," he said, "going from rudimentary control to now working with fusion totally free ranging. It’s an R&D project; we’re at the cutting edge." Most intriguingly, the Gateway project, unlike many "autonomous" vehicle trials so far, runs without needing any dedicated roadside infrastructure. Though the area has been mapped by the team, all the required sensors – LIDAR, cameras, radar and ultrasound – is carried aboard the pods, with central monitoring of the vehicles backhauled over the local 4G mobile network. 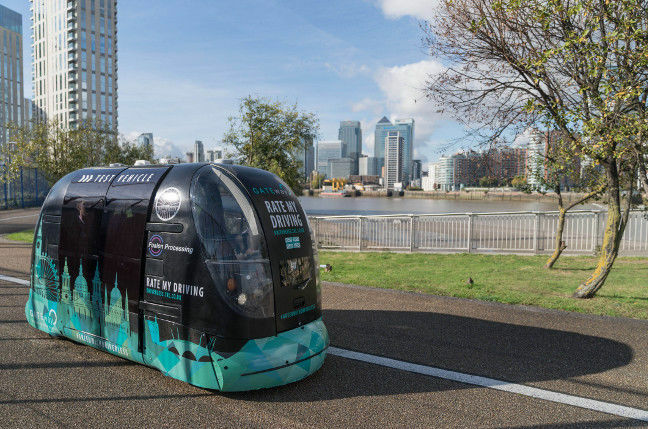 The trial has focused on driving the pods up and down Olympian Way, which is the riverside path running next to the O2 Arena in east Greenwich, London. 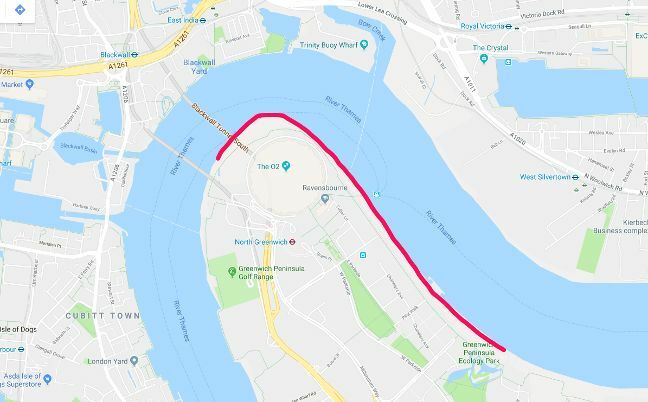 Though it is featured on Google Maps as a road, in reality it is a wide, metalled cycle path that features an unpredictable mix of cyclists, pedestrians, dog walkers, width constraints, sharp bends, dodgy surfaces and different lighting levels. "We met Google," Hutchinson said. "They were like, 'are you mad?' Everything in the States is on a grid layout. What we're doing here is putting it in a complex area." On the topic of interacting with pedestrians and cyclists, he continued: "There are rules. Well, there should be but not everyone pays attention to that. Unpredictable things can happen and we need to be ready for that." In theory, the big white line painted down the middle of the tarmac on Olympian Way separates pedestrians and cyclists. In reality, as everyone knows, people and cyclists alike go wherever they please. The Gateway consortium has coped well with that, with the pods being programmed to stop a good 20 feet (7 metres) away from marauding folk – while still being able to keep driving as cyclists whizz past, feet away from the vehicle on a non-collision trajectory. Fusion, the pods’ current software suite, runs on bespoke hardware, according to Hutchinson, who would not be drawn on specifics, though he said that it has "has a very different configuration for Gateway than for road scenarios". The key thing is we keep it small and very power efficient. The future is electric vehicles – power consumption is important. Andy Frost, pod-maker Westfield's head of deployment and trials, chipped in: "A year ago we had a computer the size of a bedside cabinet. Now it's two small units." This appears to be a reference to Oxbotica, previous provider of the driverless' vehicles electronic brains. Oxbotica parted ways with the trial last summer. As for the pods' performance in varying weather conditions, Frost referred to the bad weather of February, saying: "It did OK in the snow, though it had no members of the public on board. Not worth the risk! It was a good proof point, though, and we were surprised how well they coped. A few years ago we wouldn’t have run at night, or in rain, snow, fog …. the more data we get, the better we go." Riding in the vehicle was straightforward at its governed max speed of 9mph (14.4kph). One of the trial's team members acted as a safety steward, sat inside the pod and gazing at a screen which showed feeds from the sensors, hand hovering over the big red emergency brake button. Otherwise, it was just like a journey in a London taxi – right down to Lycra-clad cyclists whooshing past within inches of the vehicle and the occasional slamming-on of brakes as clueless folk bimbled in front of it. Despite Westfield’s best efforts with the pod's suspension, it was plain that the surface of Olympian Way is not maintained to the same standard as a proper road. While the pod kept its mandated course on the correct side of the white line, your correspondent was left wondering whether a human driver might have been better at dodging cracks and bumps caused by tree roots under the surface. When we asked what the biggest problem the trial had encountered so far was, Frost was quick to reply: "People on mobile phones with headphones! One young lady with 'safety first' on her jacket in particular," he recalled, describing how she slowly walked down the cycle half of the path, not realising that the pod was following her "like a dog", complete with flashing yellow beacon and bleeping audio alarm. Was there any risk of her getting run over by the pod, we wondered? "Nope," replied Frost cheerfully. "There are safety stewards on board who go through a robust training regime: they understand the boundaries of what the sensors can do. They get quite well versed in hazards en route," he said. "The value for us," said Hutchinson, "is learning the interactions with people, how they react or don’t react. A dad with a small child stepped in front to see if it would stop! To my knowledge he was nothing to do with the project, yet he was so confident it would stop. We have to make sure that it can cope – and, thank god, it did." At this point of the journey our steward beeped the horn. Seconds later we bumped our way past a door leading into a construction site next to the path, set into the usual 3m (10 foot) high wooden boards. Securing the cars was something both Hutchinson and Frost were keen to emphasise they cared about, with the former describing it as "something you always have to take seriously", adding: "It has been designed so the best you can hope for is to take it out of use, an annoyance rather than a safety concern." All in all, the current state of play looks sound. The pods drive themselves up and down and are seemingly routine to locals, many of whom ignore them as we trundle past. The software ("Level 4, but technically Level 2 with the safety steward") is evidently up to the job of navigating over this carefully mapped London thoroughfare.